Rheem electric 63 gallon water heater. Exclusive Home Depot model. Offering exceptional value. Providing an ample supply of water to households with 5 - 6 people. This model has a 6 year limited tank and 1 year parts warranty. A patented magnesium anode rod design incorporates a special resistor that protects the tanks from corrosion, providing longer tank life. This unit comes with two 3800 watt elements and an automatic thermostat which keeps the water at the desired temperature, providing faster hot water delivery. Requires 240 volt electricity (a 25 amp breaker, with 10 gauge wire from the panel). Want better warranty, and power? Trade up to Rheem Performance (SKU # 1000792904). 63 gal. tank provides ample hot water for households with 5 or more people. Two 3800 watt elements for faster water temperature recovery. EcoSmart Electric Tankless Water Heaters, also called Instantaneous On Demand Water Heaters, provide endless hot water on demand and only as needed. Self modulating flow sensor technology regulates the amount of energy required to heat the water needed. This Smart Technology electric tankless water heater is configured for climates where incoming water temperature can reach as low as 37 Degrees Fahrenheit. The ECO 27 is capable of heating nearly 3 gallons per minute at this temperature. The ECO 27 is the largest electric tankless water heater available with Self Modulating Technology. These models are well suited for homes in the Northern U.S. and Canada and in the southern U.S. that have large Roman-style or Jacuzzi tubs and that have generally more demanding water usage needs. The Rheem Performance Line. Exclusive to the Home Depot! Featuring Super Sentinel, a self diagnostic system with digital display that alerts the user to the operating status of the heater. Wink / Wi-Fi enabled*, you can control and monitor your water heater from the convenience of your smart phone or tablet*. 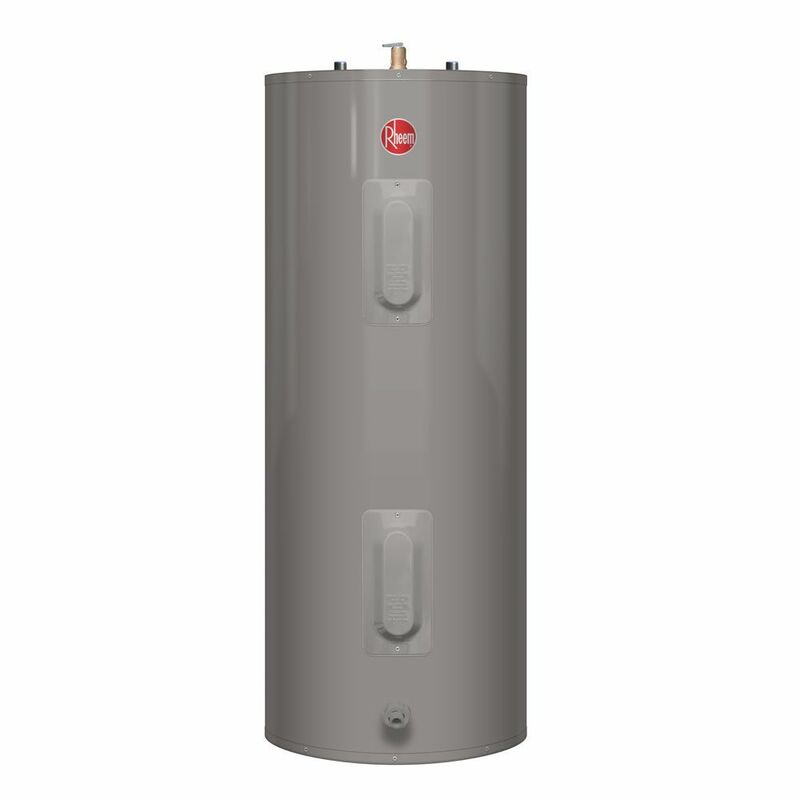 A 39 gallon electric water heater providing exceptional performance to households with 2-4 people. Rheem's premium 12 year limited tank and parts warranty plus a 1 year in home labor warranty. This unit comes with two 4500 watt stainless steel elements and an automatic thermostat which keeps the water at the desired temperature, providing faster hot water delivery. Includes brass drain valve for additional leak protection. Requires 240 volt electricity (a 30 amp breaker, with 10 gauge wire from the panel). *With purchase of the Rheem electric Wi-Fi module. Save water and electricity by putting hot water right where it is needed. SHC Mini-Tanks are superbly well-insulated and have the lowest standby losses in the industry. Lightweight and stylish, they easily mount under or near a sink to supply hot water quickly. No special wiring is required. The world leader in advanced water heating technology since 1924, Stiebel Eltron's engineering excellence and high-quality manufacturing results in products fulfilling the highest expectations of performance and reliability. 63 Gal 6 Year Electric Water Heater Rheem electric 63 gallon water heater. Exclusive Home Depot model. Offering exceptional value. Providing an ample supply of water to households with 5 - 6 people. This model has a 6 year limited tank and 1 year parts warranty. A patented magnesium anode rod design incorporates a special resistor that protects the tanks from corrosion, providing longer tank life. This unit comes with two 3800 watt elements and an automatic thermostat which keeps the water at the desired temperature, providing faster hot water delivery. Requires 240 volt electricity (a 25 amp breaker, with 10 gauge wire from the panel). Want better warranty, and power? Trade up to Rheem Performance (SKU # 1000792904).